We can ship to mostly any address in the world. Note that there are restrictions on importing some products, and therefore in some cases they cannot be delivered to international destinations. When you place an order, we will estimate shipping and delivery terms for you based on the availability of your items and the shipping options you choose. Depending on the shipping method you choose (if eligible for your country), shipping date estimates will be shown on the "Location & delivery option" page during Checkout. In order to keep shipping costs down, our International shipping is done via Lithuanian Post service provider. All parcels are registered with a tracking number, which is sent to you by email, also with a details to check the delivery status, after the order is accepted by the courier. The postal activities in Lithuania and the relations between the postal service providers and the users are regulated by the "Postal" and other laws, decrees of the Government and other "Legal acts"of the Republic of Lithuania, the Universal Postal Convention and its regulations, and international agreements to which the Republic of Lithuania is a party. When you submit your order we will e-mail you a preliminary order confirmation. When your order has been packed we will send you the final order confirmation, also by e-mail. Please also note that the shipping rates for items we sell are weight-based and depends on your living location. The weight of any such item can be found on its detail page. We offer Free shipping for orders coming from Lithuania! All orders from Latvia and Estonia, which exceed 100 Eur, also qualify for the Free shipping! We are shipping out the orders within the 24h after transaction confirmation. In most of the cases, the products are shipped on the next day, after placing the order. Albania, Andorra, Belarus, Bosnia and Herzegovina, Holy See (Vatican), Liechtenstein, Macedonia, Moldova, Monaco, Norway, Russia, San Marino, Serbia, Turkey, Ukraine, Croatia, Montenegro, Switzerland. We also ship massive orders, which expand 10kg weight range. If you want to order products, of a greater weight than 10kg, please contact us for more info considering delivery, or make multiple orders, which do not expand 10kg range. Terms for delivery of postal items presented in the table below are only approximate. Delivery terms may vary due to circumstances beyond the control of Lithuania Post. The day on which the item is submitted to a post office/collected by a courier is not included into the number of delivery days. ** The delivery terms do not include the time needed for customs procedures which usually take 24 hours if item documents have been submitted properly. 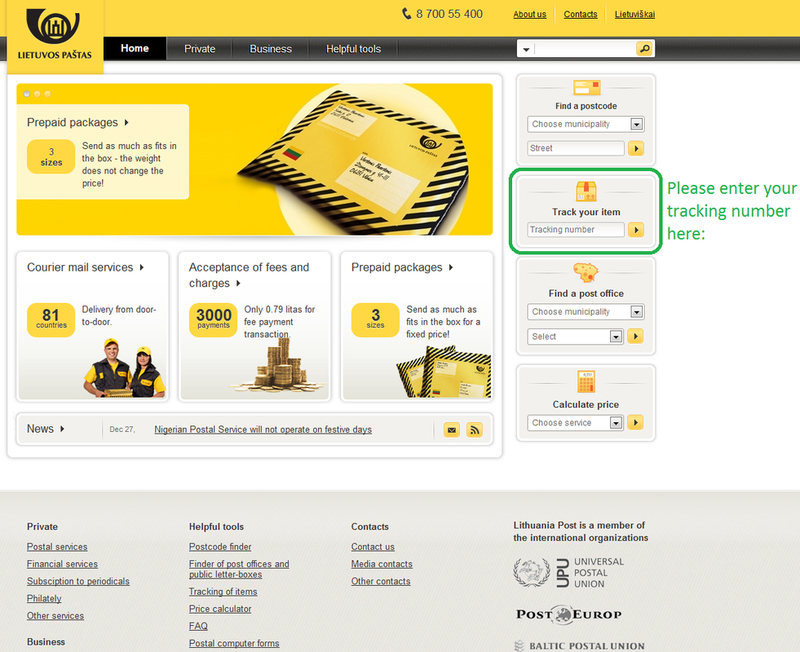 We cooperate with Lithuanian post office (Lietuvos paštas) to deliver your order. This is due to their fast and safe deliveries. Means the clearance, distribution, transport and recorded delivery of postal items through a courier and the provision of additional services requested by the sender. The services include the pick-up, sorting, and high-speed delivery of items to their addresses as well as preparation of necessary postal documentation. Postage security and confidentiality is guaranteed. It is a modern, simple and reliable way of sending mail items WORLDWIDE. All the products shown on our webpage are available with no delay if nothing else is mentioned.